Is Dannon Activia Good for Digestion and Acid Reflux? Yogurt contains live beneficial bacteria called probiotics that help digestion and boost the immune system. In addition, calcium strengthens the muscle in your lower esophagus, helping to prevent acid reflux. Dannon Activia yogurt contains probiotics and is a good source of calcium. Choose low-fat or nonfat versions of Activia -- high-fat foods aggravate acid reflux, according to the West Shore Endoscopy Center in Pennsylvania. More than 100 trillion bacteria and yeast live in your digestive tract; they aid in digestion and keep your immune system functioning by allowing to you to effectively absorb the nutrients from the foods you eat. Activia contains a specific strain of Bifidobacterium called Bifidus Regularis, a trademarked name for Bifidobacterium lactis DN-173 010. According to Dannon, "Activia with Bifidus Regularis helps regulate the digestive system." Probiotics also promote regularity, stop diarrhea and help treat irritable bowel syndrome, gas and bloating. When the sphincter muscle at the base of your esophagus doesn't close properly, stomach acid and undigested food rise into your esophagus, causing heartburn and acid reflux. Foods high in calcium strengthen your esophageal muscle and help prevent acid reflux. Activia, like most yogurts, is a good source of calcium. Although calcium content varies based on variety and flavor, some Activia products contain up to 20 percent of the RDA for calcium in a single 4-oz. serving. Choose a nonfat or low-fat yogurt, as the fat content of whole milk can weaken the sphincter muscle in your lower esophagus. A single serving of Dannon Activia is 4 oz., but the Dannon website notes that eating up to three servings daily will help maximize the benefits of Bifidus Regularis and promote regularity. The nutritional content varies between nonfat and full-fat flavors of Activia; lower-fat versions average about 70 calories per serving, while full-fat versions have twice the number of calories. If you decide to add three servings of Activia to your diet, choose the lower-calorie flavors. 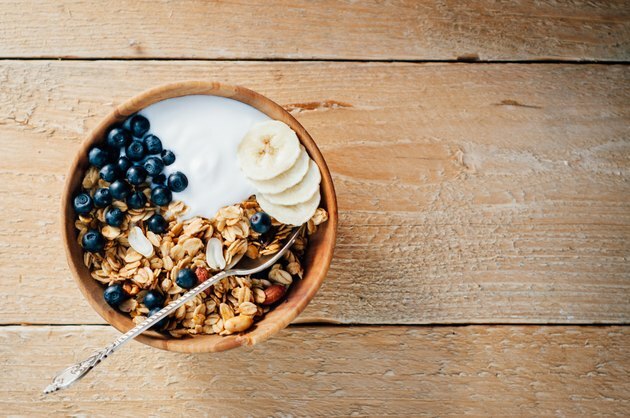 Dannon's Activia line of products, which includes yogurt, yogurt smoothie drinks, and yogurts mixed with fiber, cereal or granola, can be part of a healthy diet to promote regularity, aid in digestion and perhaps help prevent acid reflux. There are many causes of acid reflux -- from obesity to pregnancy and anatomical abnormalities such as hiatal hernias. Eating low-fat, calcium-rich yogurt could help prevent acid reflux, depending on the cause -- but losing weight and solving other underlying medical issues are typically necessary. Activia.com: How Can Activia Help Me?